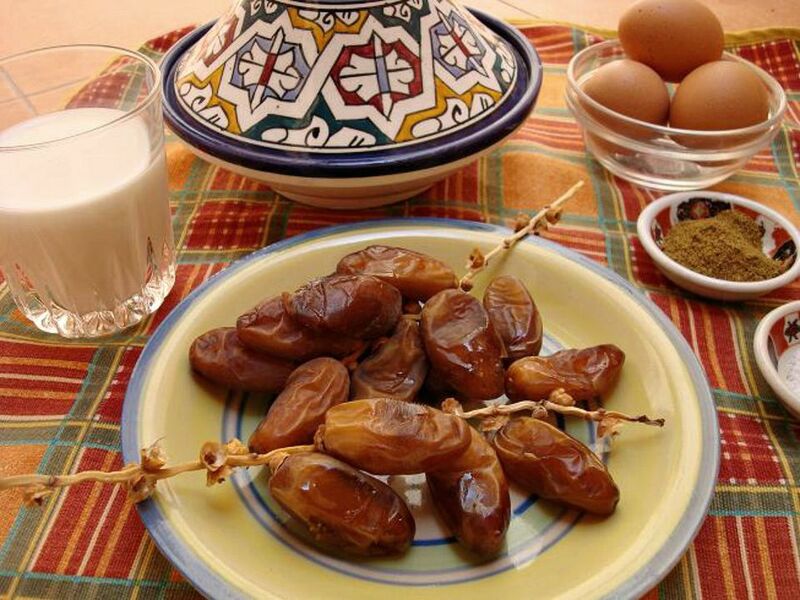 Dates, Milk and Eggs at a Moroccan Ftour. Ramadan, the Islamic month of fasting, involves abstaining from food, drink, sexual relations, smoking, and other activities between sunrise and sunset. Its conclusion is marked by Eid al-Fitr, one of the two major Islamic holidays. It literally translates to mean "holiday for the breaking of the fast." In Morocco, this holiday time is usually a time for big family gatherings. And with large get-togethers comes great food layouts, too. Although the focus of Ramadan is spiritual with extra prayers, acts of charity, and other worship rituals—many cultures place a surprising emphasis on food during this holy month of fasting. Iftar, the meal at which Muslims break their fast, is highly anticipated, and even children who do not fast yet (due to their age) look forward to the food spread in the evening. In Morocco, iftar is more commonly called ftour, the same word used for breakfast. Dates, milk, juices, and sweets typically provide the sugar surge needed after a day of going without food. ​Harira, a hearty lentil and tomato soup, satisfies hunger and restores energy. Hard-boiled eggs, sweet or savory filled pastries, fried fish, and various pancakes and flatbreads might also be served. Large batches of sweets such as sellou and chebekia are traditionally prepared in advance for use throughout the month as are cookies and other pastries. These, and other Ramadan recipes can be made all year round, but they are especially popular during this holy month. There are plenty of Moroccan foods that you can prepare ahead of time, such as ftour items that you can make and freeze well before the month of fasting begins. Since family get-togethers usually include extended families and members of the community in large gatherings, a huge tagine is often prepared, served with the crusty Moroccan bread called khobz, fresh fruit, and mint tea. There are a number of religious and cultural traditions associated with Ramadan in Morocco from the sounding of the horn to warn worshippers that dawn approaches to buying new clothes for prayer time. Nafar pre-dawn warning: The sounding of a cannon or the blowing of a horn by a nafar (a town crier) to awaken families in time to take a pre-dawn meal before the day of fasting begins. Another canon, accompanied by the call to prayer (adhan) for the dawn prayer alerts those fasting that no more food or drink may be taken until sunset. Zowaka announces sunset arrival: The blasting of a cannon or the sounding of an air raid siren (zowaka) is used to alert those fasting that the sunset prayer time has arrived and that they may now eat and drink. Prayer rituals: Many Muslims attend extra congregational prayers during Ramadan including tarawih or tahajjud, a night prayer which takes place in the early morning hours when people are normally sleeping. This prayer is recommended but not obligatory. Laylat al-Qadr: The 27th night of Ramadan is traditionally singled out as being the most likely date for Laylat al-Qadr, the most important night in Ramadan, and accordingly, many Moroccans serve traditional dinners, hold family gatherings, and perform the tahajjud prayer. New prayer attire: In anticipation of their increased attendance of prayers, many Moroccans have the annual habit of buying or making new traditional cloaks (djellabas) in time for Ramadan. Reading of the Quran: Although reading and memorizing of the Quran is a year-round effort by many Muslims, Ramadan is a time when extra effort is made and many Muslims strive to read the entire Quran at least once during the holy month.